ThumbsPlus is a multi-talented application that will help you organize, view, edit, print, catalog and find all of your graphic files. It supports over a hundred digital camera, raster, vector, font and multimedia file formats. It provides superb thumbnails, a comprehensive graphic database with keywords, user-defined fields, and an easy-to-use and customizable user interface. It includes features found in no other product, such as sorting by image similarity and location of similar images. Other features include: 48-bit color and 16-bit grayscale support, contact sheets, printed catalogues, a Web Page Wizard, batch image processing, lossless JPEG rotation, watched ('hot') folders, automatic renaming, cataloguing of offline volumes, TWAIN support, and image galleries. The program includes many image editing features, most available in batch as well as interactive mode, including: color adjustment, color depth, color balance, color profile, color replacement, histogram stretching, auto-correction, image stamping (text and images), alpha channel, image combination, image compare, watermarking, built-in and custom image filters, resizing, rotation, turning, mirroring, cropping, and trimming to proportion. Python scripting is also supported. ThumbsPlus supports viewing and slide shows of raster, vector, multimedia and font files. Plug-ins are available in the Professional and Network versions for raw files from almost all digital cameras, Postscript, PDF, EPS and AI files, and EC Software IPP files. 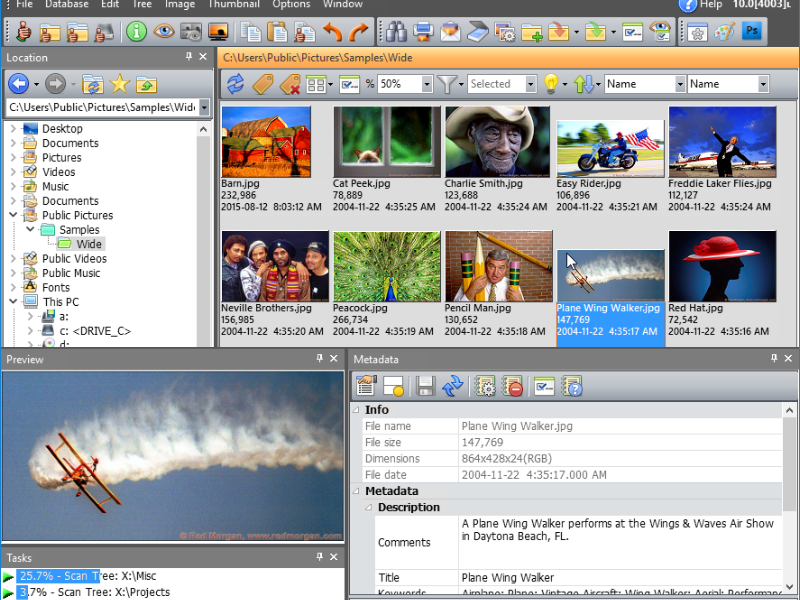 ThumbsPlus can share a database between multiple users and multiple computers, from a small workgroup to a large enterprise. ThumbsPlus - ThumbsPlus is a highly customizable image database / thumbnails / graphics editor application that makes it easy to catalog, locate, maintain and modify all your digital images, graphics, font, metafile, and multimedia files. HoudahGeo - HoudahGeo is a photo geocoding and geotagging tool. Use HoudahGeo to attach GPS coordinates and location names to your photos. HoudahGeo writes EXIF and XMP geotags to JPEG and RAW image files. Just like a GPS-enabled camera. Acme CAD Converter - DWG Converter 2018 - Batch Convert DWG to PDF WMF BMP JPEG GIF PLT SVG CGM EPS, and also supports the conversion between DXF and DWG file versions (R2.5-R2018). Interactive Image Gallery - Interactive Image Gallery is a PHP-based image hotspot creator script which will blend into all kinds of websites. Set different types of hotspots (icons, thumbs, boxes) on each of your pictures, show closer views and provide any additional details. DWG to WMF Converter MX - DWG To WMF Converter MX allows you convert DWG to WMF, DXF to WMF and DWF to WMF directly without need of AutoCAD, it converts DWG, DXF and DWF files into vector WMF files, quick and easily. 4Videosoft 4K Video Converter - 4Videosoft 4K Video Converter is the most professional 4K converter software in market. By using this software, you can convert 4K videos to 1080p for playing on TV, iPhone, PC and more devices and also upscale 1080p video to 4K to get 4K effect. 4Videosoft Phone Transfer - 4Videosoft Phone Transfer is the best phone data transfer software for users to transfer files between different phones (iOS devices and Android devices) easily. You are able to transfer contacts, photos, and media with a few clicks. SortPix XL - Sort Photos and delete duplicate Photos with "SortPix XL". Manage your Photos fast and easy! First create folder structures, then drag Photos with the mouse to sort them. Also include is a Photos duplicate cleaner or duplicate Photo finder. Viscomsoft .NET PDF Viewer SDK - With Viscomsoft .NET PDF Viewer SDK , the developer can easily add pdf, tiff viewer capability to their applications.